Every delegate to the Copenhagen summit is being greeted by the sight of a vast fake planet dominating the city’s central square. This swirling globe is covered with corporate logos – the Coke brand is stamped over Africa, while Carlsberg appears to own Asia, and McDonald’s announces “I’m loving it!” in great red letters above. “Welcome to Hopenhagen!” it cries. It is kept in the sky by endless blasts of hot air. This plastic planet is the perfect symbol for this summit. The world is being told that this is an emergency meeting to solve the climate crisis – but here inside the Bela Centre where our leaders are gathering, you can find only a corrupt shuffling of words, designed to allow countries to wriggle out of the bare minimum necessary to prevent the unravelling of the biosphere. Staggering across the fringes of the summit are the people who will see their countries live or die on the basis of its deliberations. Leah Wickham, a young woman from Fiji, broke down as she told the conference she will see her homeland disappear beneath the waves if we do not act now. 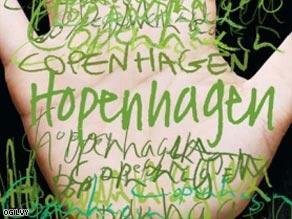 “All the hopes of my generation rest on Copenhagen,” she pleaded. Dazed Chinese and Indian NGOs explain how the Himalayan ice is rapidly vanishing and will be gone by 2035 – so the great rivers of Asia that are born there will shrivel and cease. They provide water for a quarter of humanity. We know what has to happen to give us a fighting chance of avoiding catastrophe. We need carbon emissions in rich countries to be 40 per cent lower than they were in 1990 – by 2020. We can haggle with each other over how to get there but we can’t haggle with atmospheric physics over the end-goal: the Earth’s atmosphere has put this limit on what it can absorb, and we can respect it, or suffer. Yet the first week of this summit is being dominated by the representatives of the rich countries trying to lace the deal with Enron-style accounting tricks that will give the impression of cuts, without the reality. It’s essential to understand these shenanigans this week, so we can understand the reality of the deal that will be announced with great razzmatazz next week. Most of the tricks centre around a quirk in the system: a rich country can “cut” its emissions without actually releasing fewer greenhouse gases. How? It can simply pay a poor country to emit less than it otherwise would have. In theory it sounds okay: we all have the same atmosphere, so who cares where the cuts come from? But a system where emissions cuts can be sold among countries introduces extreme complexity into the system. It quickly (and deliberately) becomes so technical that nobody can follow it – no concerned citizen, no journalist, and barely even full-time environmental groups. You can see if your government is building more coal power stations, or airports, or motorways. You can’t see if the cuts they have “bought” halfway round the world are happening – especially when they are based on projections of increases that would have happened, in theory, if your government hadn’t stumped up the cash. A study by the University of Stanford found that most of the projects that are being funded as “cuts” either don’t exist, don’t work, or would have happened anyway. Yet this isn’t a small side-dish to the deal: it’s the main course. For example, under proposals from the US, the country with by far the highest per capita emissions in the world wouldn’t need to cut its own gas by a single exhaust pipe until 2026, insisting it’ll simply pay for these shadow-projects instead. It gets worse still. A highly complex system operating in the dark is a gift to corporate lobbyists, who can pressure or bribe governments into rigging the system in their favour, rather than the atmosphere’s. It’s worth going through some of the scams that are bleeding the system of any meaning. They may sound dull or technical, but they are life or death to countries like Leah’s. Trick one: hot air. The nations of the world were allocated permits to release greenhouse gases back in 1990, when the Soviet Union was still a vast industrial power – so it was given a huge allocation. But the following year, it collapsed, and its industrial base went into freefall – along with its carbon emissions. It was never going to release those gases after all. But Russia and the eastern European countries have held on to them in all negotiations as “theirs”. Now, they are selling them to rich countries who want to purchase “cuts”. Under the current system, the US can buy them from Romania and say they have cut emissions – even though they are nothing but a legal fiction. We aren’t talking about climatic small change. This hot air represents 10 gigatonnes of CO2. By comparison, if the entire developed world cuts its emissions by 40 per cent by 2020, that will only take six gigatonnes out of the atmosphere. Trick two: double-counting. This is best understood through an example. If Britain pays China to abandon a coal power station and construct a hydro-electric dam instead, Britain pockets the reduction in carbon emissions as part of our overall national cuts. In return, we are allowed to keep a coal power station open at home. But at the same time, China also counts this change as part of its overall cuts. So one tonne of carbon cuts is counted twice. This means the whole system is riddled with exaggeration – and the figure for overall global cuts is a con. Trick three: the fake forests – or what the process opaquely dubs “LULUCF”. Forests soak up warming gases and store them away from the atmosphere – so, perfectly sensibly, countries get credit under the new system for preserving them. It is an essential measure to stop global warming. But the Canadian, Swedish and Finnish logging companies have successfully pressured their governments into inserting an absurd clause into the rules. The new rules say you can, in the name of “sustainable forest management”, cut down almost all the trees – without losing credits. It’s Kafkaesque: a felled forest doesn’t increase your official emissions… even though it increases your actual emissions. There are dozens more examples like this, but you and I would lapse into a coma if I listed them. This is deliberate. This system has been made incomprehensible because if we understood, ordinary citizens would be outraged. If these were good faith negotiations, such loopholes would be dismissed in seconds. And the rich countries are flatly refusing to make even these enfeebled, leaky cuts legally binding. You can toss them in the bin the moment you leave the conference centre, and nobody will have any comeback. On the most important issue in the world – the stability of our biosphere – we are being scammed. Our leaders are aren’t giving us Hopenhagen – they’re giving us Cokenhagen, a sugary feelgood hit filled with sickly additives and no nutrition. Their behaviour here – where the bare minimum described as safe by scientists isn’t even being considered – indicates they are more scared of the corporate lobbyists that fund their campaigns, or the denialist streak in their own country, than of rising seas and falling civilisations. But there is one reason why I am still – despite everything – defiantly hopeful. Converging on this city now are thousands of ordinary citizens who aren’t going to take it any more. They aren’t going to watch passively while our ecosystems are vandalised. They are demanding only what the cold, hard science demands – real and rapid cuts, enforced by a global environmental court that will punish any nation that endangers us all. This movement will not go away. Copenhagen has soured into a con – but from the wreckage, there could arise a stronger demand for a true solution. If we don’t raise the political temperature very fast, the physical temperature will rise – and we can say goodbye to Leah, and to the only safe climate we have ever known.